Pipe fittings are used to connect pieces of pipe together. They help you run pipe where you need it to go, whether around corners, through ceilings or underground. The success of your project can depend on selecting the right size, materials and connectors for the function you need the fitting to perform. Selecting the right pipe fitting consists of combining the right shape, material and connection type for your pipe run. 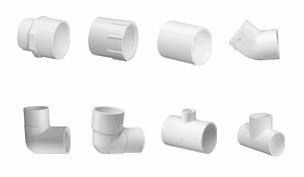 Pipe fittings come in a variety of shapes and materials, from elbows for diverting flow around corners to tees for splitting flows into multiple directions. While two different materials may often be connected together with special transitional connectors, it's best to match the material of the fitting to that of the pipes you are connecting whenever possible.